The Apps are currently down for updating! You do not need the app for a virtual race. This is a true virtual race app, not another training app. This app allows you to truly race with your friends and family in another city, state, or country in a way you could never before do. Just like a normal road race, once the gun has sounded the clock starts and will not stop until you have reached the end of your race. The app will stop the timer for you. 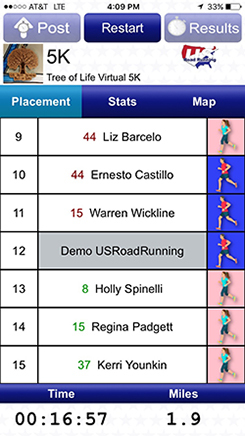 The app will also show you a few runners that are ahead of you and behind you, giving you a more of a race feel. This is a race, but the only one you're truly competing with is yourself. US Road Running will not give out any prizes for the top place finishers or age category winners. The only prize you get is the kind enjoyed by everyone living a more active life style. No stop buttons for you to push. You can start the race and then slip the phone in your pocket and the app will take care of the rest. This app uses the GPS tracking on your phone to track to measure your distance. Once it has detected that you reached the correct distance, it stops the clock and the GPS tracking. This gives you the flexibility to run any course that you choose like roads, woods, rural areas, parks, and cities. Once the race data has been download to the app you don't even need to have network coverage, so deep woods, mountain courses, and trail races are possible! Once you're done with your race simply click a button to upload your time. For longer races like marathons and half marathons we strongly recommend charging your iPhone completely before starting, because the continued use of GPS running in the background can dramatically decrease battery life. A great feature this app has is that it will show you the closest three runners ahead and behind you that have already posted a time, and it will show you how many seconds ahead and behind they are. We only show runners that are in your fitness level. We show the other racers as a means to motivate you, keep you going, and to push yourself to the next level. So enjoy watching your friends' names drop behind you as you push ahead. 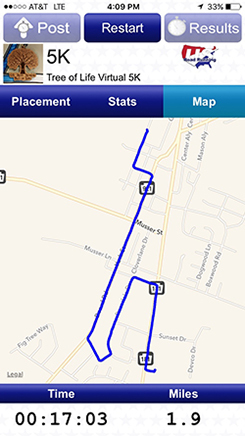 This app connects to US Road Running to pull your race information. So if you purchased a virtual race from US Road Running you will be able to see it in your app. US Road Running has many different race distances including 5K, 5 Miler, 10K, 10 Miler, Half Marathon, and Marathon. As well as different Cycling distances. This app also comes with a free Demo 5K race that you can run as many times as you want. 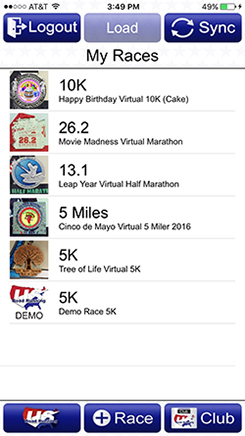 The Virtual Race app is available on the iPhone and Android smart phones. They can found by searching the app stores for each device. 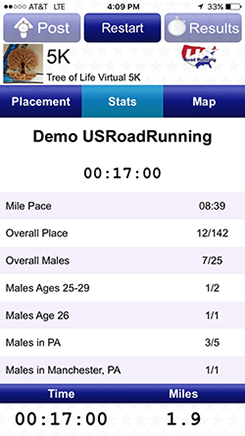 Race stats like mile pace, placement, and age categories. Map view tracking so you can see the course you ran. Noise notification of when a race has started and ended. One click uploads of race times. Links into https://usroadrunning.com to see full race results and to sign up for new races.